One of the best things about winter in New England is getting to visit places that are normally overrun with people in the summertime. In the summer, hordes of people flock to the coast to spend the day at the ocean. Tiny coastal towns become vibrant and full of vacationers. In the winter, however, these towns and beaches become quiet, people retreating to the mountains to enjoy the winter weather. The first snowstorm of the season hit in early January. It was a Saturday and it snowed all day long. We did the typical snow day activities of making a pot of soup, cozying up with blankets and watching movies for a good portion of the day. 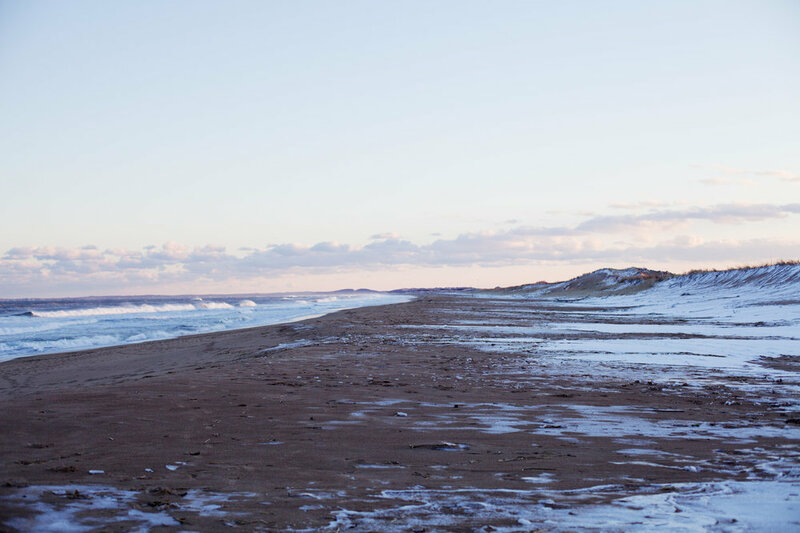 The following day we woke eagerly, layered up and ventured north to Plum Island. Plum Island is off the northeast coast of Massachusetts. It’s 11 miles long and full of wildlife, trails, and miles of seashore. We frequent the island during the unbearably hot days of summer, fleeing the city to stake out a small plot of sand to sunbathe on for the afternoon. 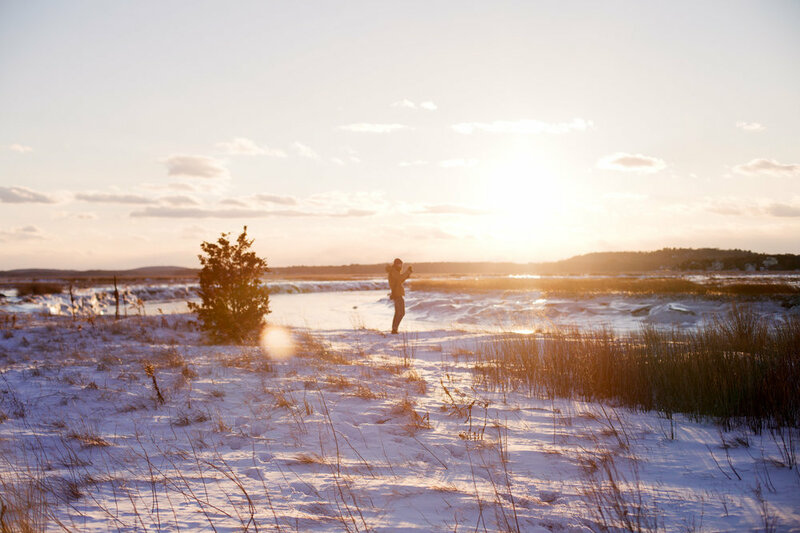 As beautiful as Plum Island is in the summer, it’s even more beautiful covered in snow. We arrived in the early afternoon and knew we only had a couple of hours until the sun set. The parking lots that are normally overflowing had barely any cars in them. We braved the 20 degree temperatures to roam the island on foot, taking the frozen scenery in and enjoying the solitude. The landscape was iced over, looking almost extraterrestrial, but the sun shone bright and the clear, blue sky reflected over the fresh blankets of snow. As we trailed around the island we eventually ended up at the ocean. The wind whipped but the familiar lulling, rhythmic churn of the ocean was still present. We stayed a while, enjoying the view as the sun dipped below the horizon until we could no longer feel our fingers. Then we retreated to the car to warm up at the local pub with a beer next to the fire.